La Isla Hostal, Barcelona, Hiszpania : Rezerwuj teraz! Since 2010 we've poured our heart and soul into our cosy, small-sized hostel in the centre of Barcelona. Located right next to the stunning Arc de Triomf, we're blessed with one of the safest, most well-connected and sought-after areas of the city. We have continuously worked towards turning our traditional 1871 Catalan building into an enjoyable, homelike experience to our beloved guests. 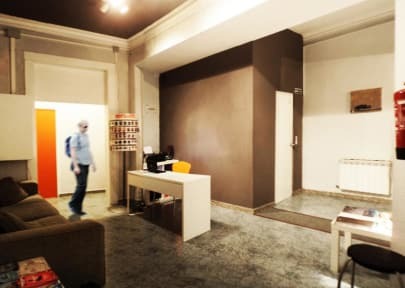 OUR MISSION is to provide Barcelona's most genuine hostel experience. At Hostel La Isla we dress casual and call our guests by their first names. We foster a sense of belonging and authenticity. We welcome our guests like family — with close personal treatment and a homely atmosphere, while providing rooms that ensure their privacy as well as a well-deserved rest. OUR GUESTS (AND THEIR PETS!) are friendly and relaxed, easy-going and independent, and fuelled by adventure and curiosity. Those who already visit us time and time again know they always have a home in the centre of Barcelona, as well as warm, friendly and familiar faces to welcome them back. Cancellations must be received at least 72 hours in advance.